If you’re looking for a flight review where the blogger swoons over how great SWISS Business Class is or how you should redeem X amount of miles to fly SWISS over X airline, then you have come to the wrong place. I will give you a spoiler and tell you that I’m not the biggest fan of SWISS Business Class as I don’t think it is a very competitive product. Their current Business Class product is old and outdated and their new Business Class product is only a slight improvement over their current offering. The Boeing 777-300ER will be SWISS’ new long-haul, flagship aircraft. SWISS currently flies them to destinations such as Bangkok, Hong Kong, Los Angles, and San Francisco and will add more routes when the Airbus A340s are phased out. This SWISS Business Class review is for Bangkok to Zurich. Approximately 10 minutes prior to boarding time, my friend Andrew and I left the Singapore Airlines SilverKris Lounge and made our way to gate D3. I took a couple pics of the bird but they all turned out pretty crappy. Sorry. Boarding started a few minutes late with First and Business Class passengers and Star Alliance Gold members, followed by Economy Class passengers. First Class passengers boarded through door 1L and everyone else boarded through door 2L. On this flight, I was seated in seat 7K, a window seat in the main Business Class cabin. 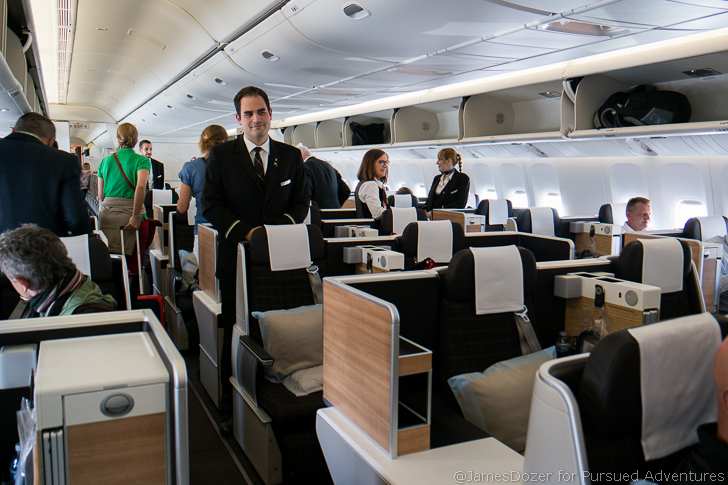 SWISS configures their Boeing 777-300ERs with 8 First Class suites in a 1 x 2 x 1 layout. Directly behind the First Class cabin and forward of door 2L, there is a mini-cabin of just 10 Business Class seats reserved entirely for HON Circle members. Aft of door 2L is the main SWISS Business Class cabin with 52 seats. The SWISS Business Class cabins are configured with Thompson Vantage seats in a 1 x 2 x 2/2 x 2 x 1 layout. These forward facing, staggered seats are not the best and do not offer direct aisle access for all passengers. On this flight, I was seated in a window seat in a pair of two and Andrew was seated in one of the single throne seats. The single throne seats truly are the best seats in the house as they offer a ton of storage spaces at the seat, increased privacy and direct aisle access. The one downside to these seats are the fixed armrests. Unlike the other seats, you can’t lower the fixed armrests in bed mode to give your shoulders some extra wiggle room. The single throne seats are reserved for HON Circle members and Miles and More Senators only. The rest of us have to pick seats elsewhere. In my case, I chose a window seat on the right side of the plane. These seats are good for passengers traveling together but not so much for solo passengers. They don’t offer much privacy, can feel a bit confined and don’t offer direct aisle access. If you are traveling solo, I would not recommend these seats. Waiting at our seats were SWISS branded, noise-reducing headphones, a pillow, blanket, coat hanger and an amenities kit. No slippers were provided on this flight. These SWISS Business Class seats feature three personal reading lamps, USB port, universal electrical outlet and a hook for your headphones. The hook was great during flight for keeping your headphones secured in place and the wires from getting tangled up in the seat. The seats themselves are fairly comfortable for lounging. The air cushions can be adjusted for firmness and come with a lumbar support and a massage function. They are not the most private seats but do come with a fixed divider and a wide center armrest to separate the two passengers. Basic seat controls are located in the armrest and more advanced controls are located under the remote control cover. Storage-wise, there’s plenty of space in the large overhead bins above the seats. At the seats, however, is another story. The main storage compartment for your personal items is the closable shelf underneath the IFE monitor. The shelf is great for items such as tablets, headphone cases or magazines and the shelf can be closed to prevent your items from falling out. However, the shelf is not deep enough for laptops larger than 13 inches. Bulkhead row seats do get an additional shelf above their IFE monitors to place items such as larger laptops but not during takeoff/landing. For smaller items such as your cell phone or eyeglasses, there are a couple of cups above the center compartment to keep these items handy during flight. The tray tables are located and fold out from the center compartment. In between the two seats, there is a small compartment for your shoes. SWISS’ current amenity kits come in either a beanie or neck warmer. There is no case per-se but my beanie came with a packaged dental hygiene kit, socks, eye shades, ear plugs and a tube of unbranded lip balm. As much as I would have loved a case to hold everything and re-use again later, I think the beanie/neck warmer amenity kits are a great idea. They are stylish and practical and can be re-used many times over. However, the beanie and neck warmers only come in one size. There are only two lavatories for Business Class passengers. The lavatories are standard size but are complemented with a selection of facial products by Swiss Code. The bottles of facial mist and lotion are for use during flight and the refreshing towelettes and sample size tubes of facial moisturizer are for the taking. The Swiss Code products are non-fragrance and have a good consistency and feel to them. Directly behind the main SWISS Business Class cabin is the new “and improved” Economy Class cabin with 270 seats in a 3 x 4 x 3 layout (10 abreast). Talk about a tight squeeze! On this flight, the entire business class cabin was full and there were four flight attendants working the main Business Class cabin. As I was getting settled into my seat, the flight attendants came by with pre-departure drinks on a tray, a selection of newspapers and a warm towel. 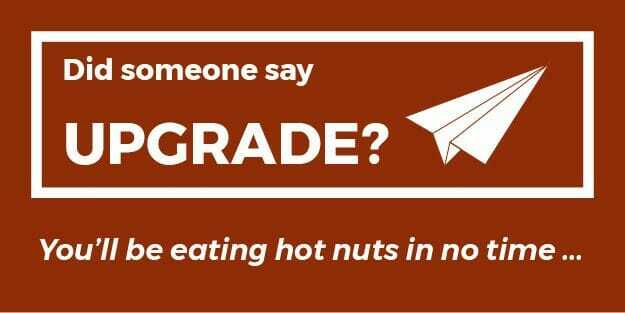 Menus were then distributed prior to takeoff. As the final passengers were boarded, the captain came on the PA to welcome us onboard and advise our flying time and flight path. We pushed back a few minutes late, taxied around to the runway and then departed for our 12 hours and 19-minute journey to Zurich. After takeoff, the flight attendants came by to take my meal order. I went with the beef stroganoff and a glass of champagne to start. I should tell you that our lunch service was very slow and finished approximately 3.5 hours takeoff. I understand that daytime meal services can be a little slower as no one is rushing to sleep but 3.5 hours is still a very long time for a three-course meal. Lunch started with pre-meal beverage and a ramekin of mixed nuts. This was followed by another round of drinks before my appetizer tray was even brought out. When it finally came, my appetizer tray consisted of cured meats with quinoa and a small side salad. The flight attendants then came by with two servings of bread before my appetizer tray was taken away. My main dish was served with a side of white rice and vegetables. The beef stroganoff was delicious and was one of the best Business Class meals I have ever had. The portion was small but the meat was tender and the seasoning was full of flavor. It was really tasty! After this, my tray was cleared and the flight attendants came by with a cheese/coffee/tea and dessert cart. I skipped the cheese but got the chocolate dessert along with a couple shots of espresso. Dinner was concluded with a piece of chocolate. As I stated above, the lunch service was VERY slow and the flight attendants seemed a little overwhelmed. They weren’t as proactive as I would have liked and plates and empty glasses stayed on our tables for a long time. The food catering was delicious but the portions were on the skimpy side. If you are a big eater, make sure you fill up in the lounge before your flight. After lunch, the flight attendants came by with bottles of water and the cabin lights were dimmed. I wasn’t tired yet so I settled in for a couple of movies and dozed off for a bit. In SWISS Business Class, the touchscreen in-flight entertainment (IFE) monitors are fantastic. They are bright, clear and crisp and can be viewed even when all the window shades are opened. If you want to watch TV in bed, the IFE monitor can be tilted down for a better viewing angle. Entertainment-wise, there was a good selection of movies, TV shows, audio entertainment, video games and an airshow to keep you entertained. Commercials were played before each selection. According to SeatGuru, these SWISS Business Class seats measure 20.5 inches in width and have 60 inches of pitch. In bed mode, the seats do recline 180 degrees flat but most people will find them too constricting as your legs go into a small foot well. The outside armrests can be lowered to give you some extra shoulder room. To lower your armrest, twist the armrest in 45 degrees towards you and then push down. The seats do lower slightly in bed mode but not enough for the window seat passenger to step over the aisle seat passenger if he/she needs to get out. I found these seats were great for lounging but not so much for sleeping. The beds were not that comfortable as there wasn’t enough space in and around the seat to move about. The entire space felt very restrictive and I hated having to wake up my neighbor every time I needed to use the loo. Halfway through the flight, the flight attendants came by with a Movenpick vanilla ice cream snack. If you are hungry in between meals, snacks such as cookies, fruits and chocolates were put out in the Business Class galley. After my snack, I watched another movie and tried to nap for a bit more but was unable to. I ended up just staying up and working on my laptop instead. About 2 hours before arrival into Zurich, the cabin lights were turned on and the flight attendants prepared for our pre-arrival meal service. I ordered the rigatoni pasta with chicken, asparagus and tomato sauce. It was served with a side of fruit and a bread roll. This meal was also delicious. Overall, I was really disappointed with this SWISS Business Class flight. The SWISS catering and in-flight entertainment options were great but everything else fell short of my expectations. The flight attendants were friendly and nice but not proactive in caring for the passengers and the meals services were very, very slow. The service felt like it belonged on a Lufthansa flight and we all know that is not exactly a compliment. But my main complaint with the new SWISS Business Class configuration is the seat itself. These Thompson Vantage seats are not good for long-haul flights. They don’t offer much space or privacy and don’t have direct aisle access for all passengers. I really wished SWISS went with a reverse herringbone configuration or even the larger version of this seat, the Thompson Vantage XL, to give their Business Class passengers a better option than what the other Lufthansa group airlines are offering. SWISS is a premium brand and really should be offering a premium product. What do you think? Have you flown SWISS Business Class on their new Boeing 777-300ER yet? If so, please let us know your thoughts in the comments section below. Thanks!